We've had a very busy Saturday so far. It started out at 1:45am when I got a call from an addict. I hate the calls in the middle of the night because anytime the phone rings after 10pm it's usually not good news. I spent the next 30 minutes talking to someone trying to convince them treatment is the best thing for them at this time. When the alarm went off at 8:30am it seemed way too early. But we got up and headed off to Weight Watchers. Last week I lost just over 3lbs and this week I lost just under 2lbs. I was surprised since I didn't follow Weight Watchers at all during our little mini vacation. But I was very happy. I have now lost a total of 13.5 lbs. Just 50 more to go and I will be there. 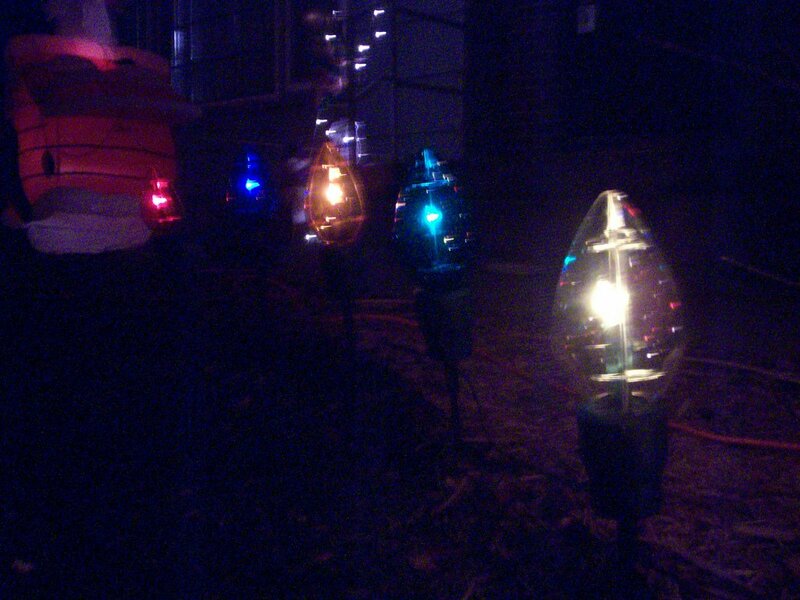 This afternoon I decided it was time to put out the outside x-mas lights. I was happy that it didn't take that long and there were no arguments during the process. Here are some pictures of our lights for 2006. The lights on our back deck are new this year. I love the way they look and it's a nice addition for this year. 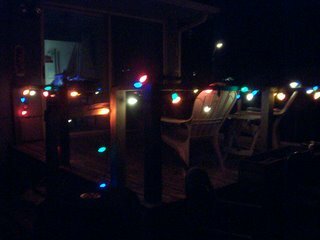 I keep thinking how much Glenn (Lynilu's husband who passed away last year) would have loved to sit out on his back deck looking at these lights. Here's our one inflatable for x-mas. I saw it two years ago and we finally found it last year. I just love it. Fits our pet house very nicely. 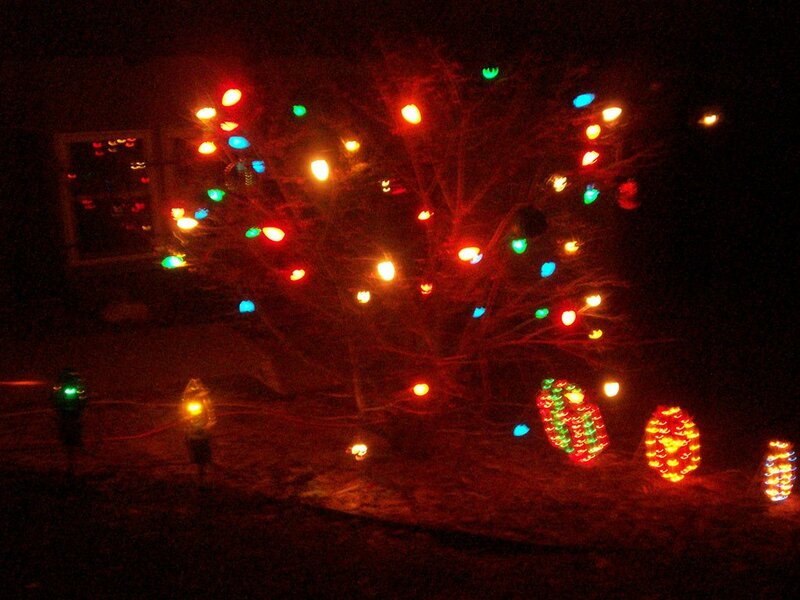 We call this our "Charlie Brown Christmas Tree". The tree is so small but we have so many lights on lit. I love it. These big pathway lights are also new. Saw them today while we were out and I just had to have them. This picture isn't that good. But trust me, they look awesome. 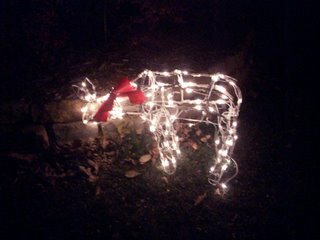 This is our deer that is in the very front of the yard. Another favorite of mine. 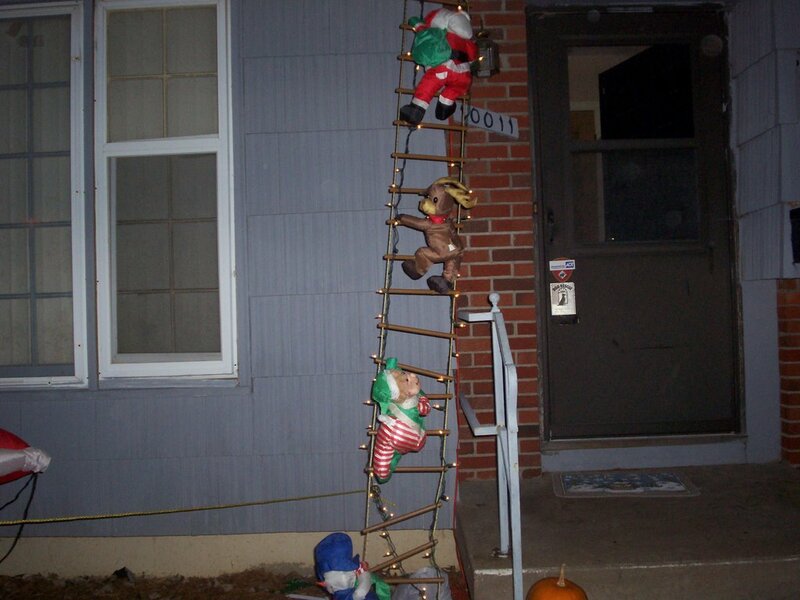 Two years ago a neighbor had this ladder. I looked all throughout 2005 and finally found it on EBAY last November. As you can see there is a Santa, a Reindeer, an Elf and a Snowman at the very bottom. So those are our outdoor decorations for this year. Next weekend we are putting up our tree and decking out the house. It's a lot of work, but so worth it. Your lights look great, I am hoping I can talk your brother in law into putting ours up tomorow. I've got the sun room cleaned up and ready for the tree and my collection of santas and snowmen. Looks great :) We are putting up our tree next weekend. I can't put anything outside, the neighbors might steal them. LOL But your looks awesome! Wowsa! Look at you go!! I'm impressed that you have done so much already. We're going to work on some of the inside stuff tomorrow and throughout the week (it's much slower with children "helping" LOL!). Next weekend it's the outside of the house (unless it's raining then the house lights have to wait)! Very nice! I read this last night, but the comment about Glenn got me, and I just couldn't write a response. Yes, Caroline, he would have enjoyed it very much, and I'll bet he is looking at the every night with appreciation. 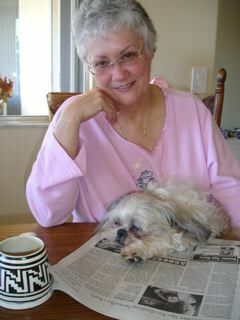 lynilu--i am sorry the comment with the pic upset you. i just kept thinking of glenn looking out at the lights. his presence in our neighborhood is still here in so many ways. Oh I like the big pathway lights and the reindeer! We'll have to start thinking about Christmas soon, I guess. Love the lights and congrats on your continued weight loss! 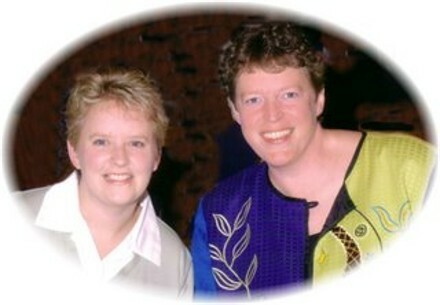 wendy&karen--thanks and also thanks for the congrats on the weight loss. 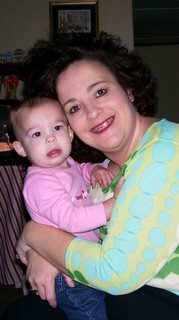 with me taking my meds on a daily basis the weight is really coming off easily. Love all of your decorations except for the wicker deer. 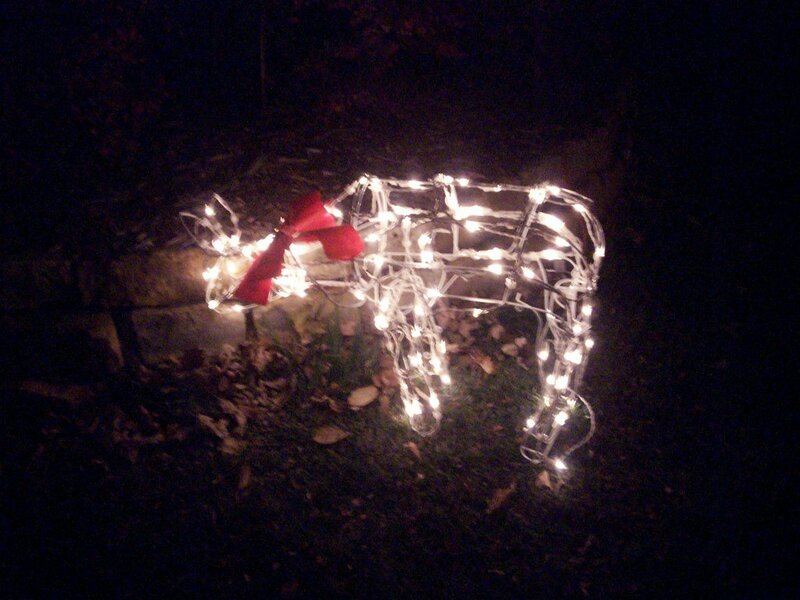 For some insane reason I HATE those lighted wicker deer, some move, some don't. I have to suppress the urge every Christmas not to go out and shoot them with a bb gun. 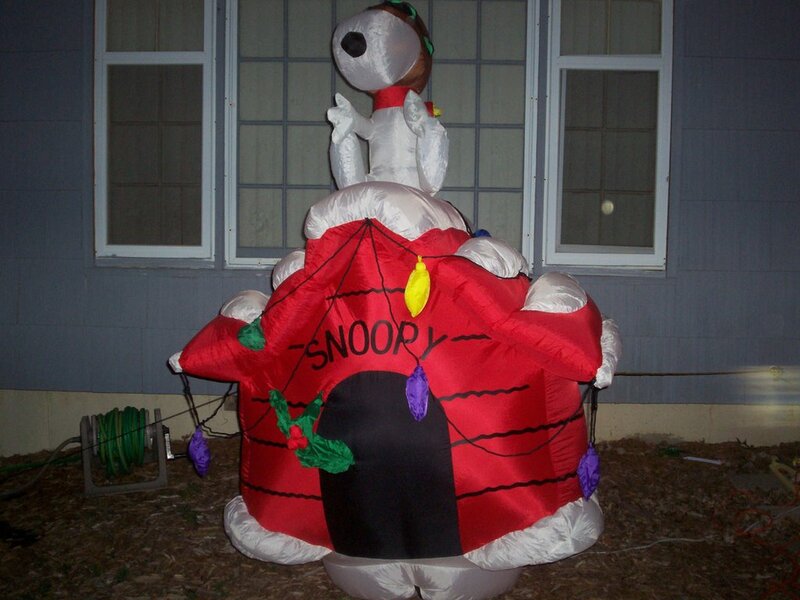 I am contemplating getting the Snoopy doghouse!